Most home recording takes are going to have a little bit of background noise, no matter how careful we are to record really clean. Noise removal/reduction can help. But it does have some limits. a.) It only works *really* well on steady noise, like a fan somewhere in the background (computer fan, for example), or "AC hum". b.) It can sometimes make your instrument or voice sound a bit weird, or can actually make noises that weren't there in the first place. Those are called "artifacts" or sometimes are nicknamed "pixie dust", since they sometimes will sound like a high pitched random trilling noise that sort of comes and goes. c.) It can only work well if you have a reasonable length sample of the noise that was present when the recording was being made that is *just* the noise, without you playing or even moving around. 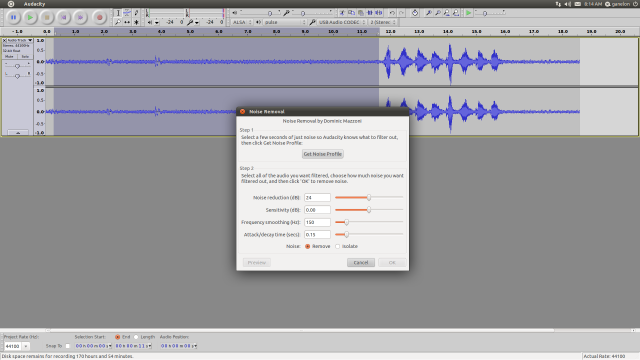 Even with those considerations, though, it is still quite useful, and not hard to do with Audacity. First, let's look at a track with some noise. The big blobs are showing where I said "test 1, 2, 3, test 1, 2, 3". 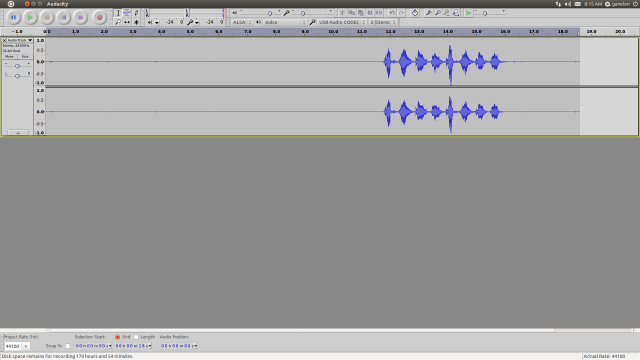 The thick line that goes all the way through the recording is noise. Quite a lot of noise, actually. Two window fans and my computer's cooling fan whining away on "high" setting. 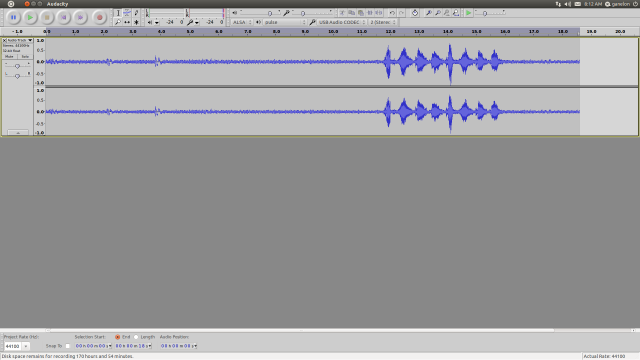 So here's how we fix it.. First we click and drag to highlight several seconds of the part that we know is just noise. Next we go to Effects>Noise removal. I'm not sure as the menus are the same in the windows and mac versions of Audacity, but it is one of the default plugins included with Audacity, so you'll find it wherever Audacity has your effects. And we'll get a pop-up box that looks like this..
For this step we tell it to "Get Noise Profile". That will usually only take a second or two. Now we want to deselect the bit we highlighted for the noise profile sample, or Audacity would think we only want it to work on the highlit part. I usually do that by just hitting the "Skip to start" button, which is the 4th round button from the left near the top of the Audacity screen. Yay! See how the thick line is all gone now? Congrats, you have just done "noise redux". But always check your work. When doing this on your own music tracks, listen the track through all the way to make sure everything sounds ok. Most of the time it will. On the occasions where it doesn't and it sounds weird or has odd clicks or "pixie dust" or whatever, use the Edit-Undo to go back to before you selected the section for the noise analysis sample. Highlight a slightly different section (it can be mostly the same, just try to start and end it in slightly different spots) and go through the process as before and that will *usually* fix it. Thank you, Daniel, that was most helpfull. I have tried noise reduction in the past but never used it correctly. Yes, thank you Daniel! Any tips on using Audacity, or making better recordings are most welcome. You should check out Reaper. It's an awesome Digital Audio Workstation! Yup, it looks pretty cool, Joe. It's been mentioned before. However, for the sake of tutorials, the only software I will be covering has to be both free and cross platform, so that any of our members can use it. While Reaper isn't expensive, so far as DAW software goes, it does cost about as much as some folks from this forum were able to afford for their actual instrument. I prefer not to leave folks out. Audacity is a bit basic and not as pretty as some other options, but it is popular enough that there are plugins and tutorials to do most anything that will be necessary for home recording, at least for beginners. 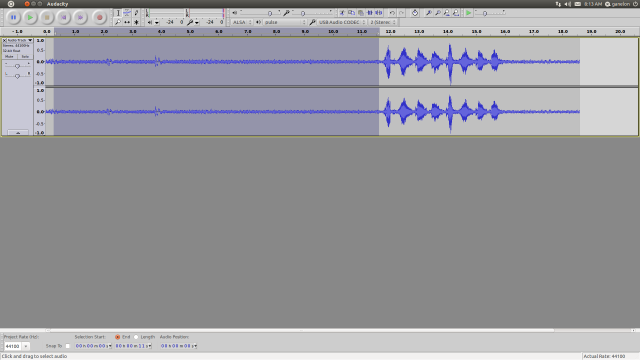 However, if you want to start a thread to cover some things about how to use Reaper, hey, knock yourself out. LOL But I'm doing basics for the least common denominator. Keep it coming Dan! I actually use Sony Acid (I always feel a little strange saying I use Acid), but a lot of what you talk about in regards to Audacity is very similar on Acid, so I too really appreciate your help on these things. Again, you are a gentleman and a scholar. The basic principles are usually pretty much the same, regardless of what software you use for noise removal/reduction. Some software has a more complex algorithm for noise removal than Audacity, but the simple one in Audacity is easy to use and free. It can sometimes do wonders for making a home recording sound a bit better. Like most effects, one of the best things you can do is just play around with it a bit. Do a lot of little "junk" recordings of practices or playing Twinkle Twinkle or whatever and make a little game out of just seeing how much you can clean it up. That is probably the best way to quickly develop a good sense for what noise removal/reduction can and can't do for you. An ounce of experience is worth pounds of reading with this sort of thing, and the Edit>Undo function can be one of your best friends. @wookieman: I've used Sony's Acid software in the past. Not bad at all, once you get used to how it is set up and how it works. You can get some really big sounds out of it. A point I feel should be said about noise reduction/removal is that it is an effect. All effects, including old stand-bys like eq and reverb, introduce some degree of distortion. 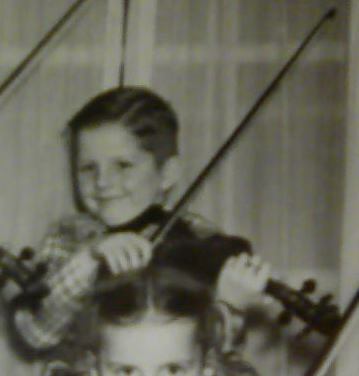 Distortion can be considered any deviation from how the original source (like a musical instrument or a voice) sounded. Some folks may like to use a different word for deviations they *like*, but in the strictest sense, all deviation from the source material is distortion. Effects are used to tailor a sound to be more to the taste of the engineer and (hopefully) listeners. If you are recording yourself at home, for better or worse, *you* are the engineer. You are also always one of the listeners. Where to use effects and how much of them to use is always a matter of taste and a judgement call. With any effect, use your ears, and also use your taste. If you are recording yourself at home, for better or worse, *you* are the engineer. You are also always one of the listeners. May I also add, we are also the first listener and our own worst critic.